Not really a grass, but this Japanese native Iris can be used where a grass-like form and texture is desired. 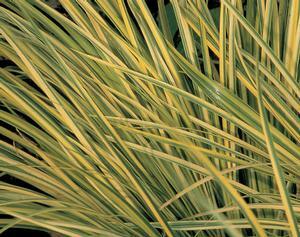 Beautiful green and golden striped leaves form a pleasing mounded shape. Loves moist conditions so especially suited to ponds.